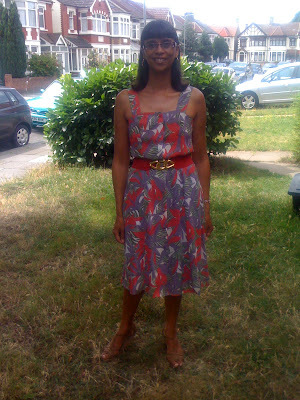 Although not sunny, it is very humid today, so I thought I'd wear my vintage sundress with my new red Primark belt-I didn't even need a cardi or jacket! While Christopher was in the dentist with his dad and brother, I went thrifting and still didn't turn up any tartan/plaid for Autumn... 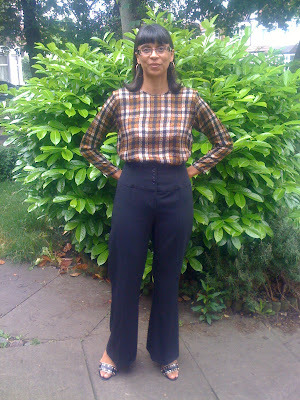 I'm not too fussed, as until I find something really worth buying (if anything), I shall think of wearing my Vintage Yves Saint Laurent silk plaid top in Autumn under a cardi or leather jacket, with jeans or trousers. Oh the dress is fantastic! It looks wonderful on you, dear Sharon Rose! Hi fabulously broke-thanks so much!! haha, a vintage dress never goes out of fashion!! Hi Acielle-always so lovely, thanks my dear! such a fashion bug! love the dress. Lovely dress and I also adore the pants in the second picture. both lovely looks. Love the colors of that dress on you, and I'm jealous of your ability to pull off the high-waist denim! Hi pamcasso-thanks for your lovely comment-btw, they're trousers!! Thanks for commenting upon my Collage. Hi fashion chalet-thanks so much my dear and you're welcome about the comment!! So pretty..you'd never know it was humid there. Sounds like a busy week for you, but you're getting that thrifting in. Good for you. oh man, i love that vintage plaid ysl! Not a bad plaid to "make do" with, lady! You look stunning in that vintage dress, such a great find! Loved that you paired it with that red belt. It was raining here today, so I had to wear jeans for my interview, but oh well! If you want to see my interviews-which I could translate! Its up on the blog. Thank you for your lovely comment and I love that YSL! I only love your plaid top - work it! You look gorgeous in that dress and I love that belt. I'm glad that Tartan is on it's way back in- we've always had a soft spot for the Scots since we studied abroad in Edinburgh. Can't wait to see what you find! Hi S, liking your sundress and the belt. The red belt goes great with the vintage dress! wow you changed your layout, looks good! Love the first dress, I would want it myself. you have some wonderfully unique clothing! I love your dresses! They are just so stylish and timeless.. Love the shoes with the sundress as well! That plaid blouse is just LOVE!! Hi ellie-thanks and I never miss a thrifting opportunity, haha! Hi fashion herald-so lovely of you, thanks!! Hi sal-thanks so much, I suppose where I've had it ages I need to start loving it again-haha!! Hi Silje-thanks for your lovely comment-can't wait to check your post out!! Hi asian cajuns-thanks so much and why is it when you want something in particular, you can't find it-haha!! Hi savvy gal-thanks so much!! Hi jen-thanks for your lovely comment and for noticing the layout too!! Hi always in style-thanks for that lovely comment-I would love to see your dress when it arrives!! Hi jenny h-thanks so much, my dearest! Hi nv-so kind, thanks a lot!! Hi the world is my catwalk-always so lovely, thanks so much! hope you are well too! I like your vintage sundress and red Primark belt. I´ve bought in Primark really beautiful and cheap shoes, accesories and clothes. It´s fantastic! I discovered that shop at Dublín two years ago. hitupersonalshopperviajero-thanks so much!! I love primark for accessories and shoes, but I don't tend to buy clothes from there much! the 1st outfit is fantastic ))) the vintage vibe is so hot! Hi times of glory-thanks so much my dearest, I will wait until I find the perfect tartan piece, I think!! Lovely dress :) You wear pants so well!! Hi Yiqin-thanks for your lovely comment!! Hi madamedior-so lovely, thanks my dear! !